Situated in Pudong Kangqiao New Dwvelopment Zone, the Emerald is strategically located in the center of Shanghai's eastern part. 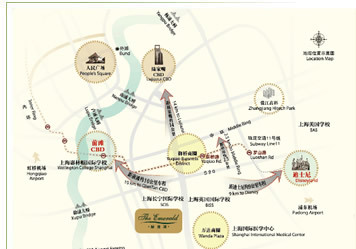 The compound is just adjacent to the Outer Ring Road, and is 3 kilometers from the Middle Ring Rd, 14 kilometers from Lujiazui and 26 kilometers from Pudong international Airport, thereby offering both the convenience and excitement of the city life as well as the tranquility and serenity of villa living. The Emerald is also situated right at the center between the much awaited Shanghai Disneyland (9 kilometers) and the new Qiantan CBD (10 kilometers) that is being developed by the govemment to house the regional headquarters of world's largest multinational corporations. The Emerald's location is planned with the needs of expatriate families in mind. We understand that when choosing a home, children's schooling is perhaps one of the most critical and deciding factors. The Emerald is located in very close proximity to two prominent international schools. Shanghai Community International School (SCIS) Lower School is located just next door to the Emerald and has a direct access to the compound, while SCIS Upper School is approximately 10 minutes driving distance. Meanwhile, British International School Shanghai (BISS) is just 5 minutes driving distance. Other international schools in Pudong such as Shanghai American School and Dulwich College Shanghai provide convenient shuttle bus services to the Emerald as well. In addition, the prestigious and newly built Wellington College International Shanghai will start its first admission in 2014. Located just 10 kilometers away, the Emerald is the nearest international villa compound to this world famous school.